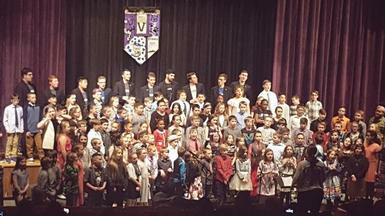 On January 16th, fourth graders from across the district united for an exciting musical experience! The fourth graders came together to present a combined concert with the college a cappella group Ithacappella, for community members, staff and parents. This concert, was a collaborative effort of the music teachers in all five elementary schools. Virgil elementary music teacher, Jonathan Keefner said, “When our team of music teachers met during collaboration time, we saw an opportunity to create community through music during a transition period where community will be more important than ever." In addition to the wonderful music that was performed, each school’s art teacher worked with their students to create a piece of art that represented their school. The five pieces of artwork were then formed into a shield which represented all of the schools coming together.